Sure-I-Can is back again with his EP, 'Seoul'. A tune that will surely captivate your aural senses. regulars, Chris Odium. label boss Lian July and we also introduce newcomers, Luiz B, and Moonwatch3r. Groovy, serene, and oh so clean, "Seoul" is a wonderfully chilled out, almost down tempo tune, with beautiful structure and choice sounds. Check out this unique track now! 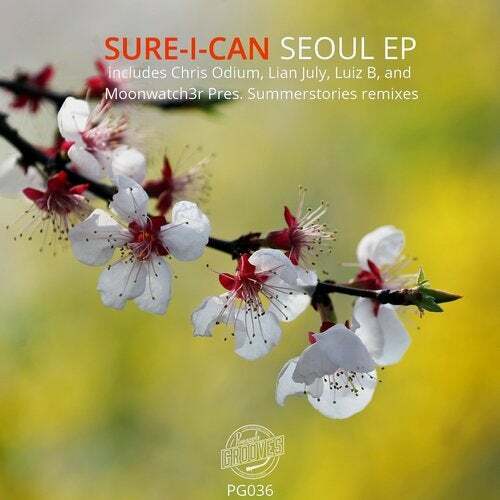 First up on remix duties is Chris Odium who never straying far from the darker side of deep house, this signature Chris Odium sound, has this "Seoul" remix on point, though it may be slightly brighter than what you're used to. Pineapple Grooves resident Lian July gets in on the remix action as well, with her revision a catchy and irresistable bass-driven groove takes over your body with such subtlety you'll not remember when you started to dance. Luiz B heads straight for shock and awe, as everything leads to one grand build up in his remix of "Seoul". A super killer groove is then thrown down with funky jungle birds, awesome bass lines that blanket the air with comfort, and an easy going tempo so it all goes down smooth. Some might save the best for last, but for us, every track is a delight. That being said, this Moonwatch3r presents Summerstories remix is quite something! A dynamic range of sounds are used in this composition, making it quite something to listen to!